a) You go out of your way to make them unhappy - or, at least, you consider it. b) You get really, really upset. c) You start to wonder if blogging is really for you. For a couple of weeks last year I remember lots of good things seemed to be happening to everyone except me. It made me unhappy, I doubted myself, and I quietly became the green eyed monster. But I never said anything to them. These bloggers had clearly worked their butts off to get such awesome stats or opportunities, and I stopped. I thought. And I respected that. I didn't let the jealousy consume me, I moved on, and I turned that envy into motivation to work harder. It's easier said than done, but it worked! There's the normal jealousy, of course, like when you really want a book that someone else has, or someone else got to be on a blog tour that you didn't. I'd be worried if there were any blogger that doesn't get jealous, because it's natural to be! We envy bigger bloggers, and I'm sure they envy people too. But when it starts to consume you, that's when you need to battle that envy with some rationality. If you need help with that then this post is for you - and you can adapt it for offline life, too. 1) Think before you type. If what you're going to say implies that the blogger shouldn't have gotten whatever they got, don't say it. Whether it's high stats, a rare ARC or something else, it's going to be down to their hard work. 2) Turn it into motivation. I know it's easier said than done, but if you let the jealousy consume you all it's going to do is make you demotivated, and the quality of your blog posts will probably suffer as a result. Instead, let it motivate and inspire you into doing better. Have a brainstorm. Think of things you can do to improve, but make sure whatever you're doing is what you really want to do. Soon, you'll be getting whatever it was you were jealous of before, and you'll probably be happier with your blog too! 3) Remember why you started in the first place. 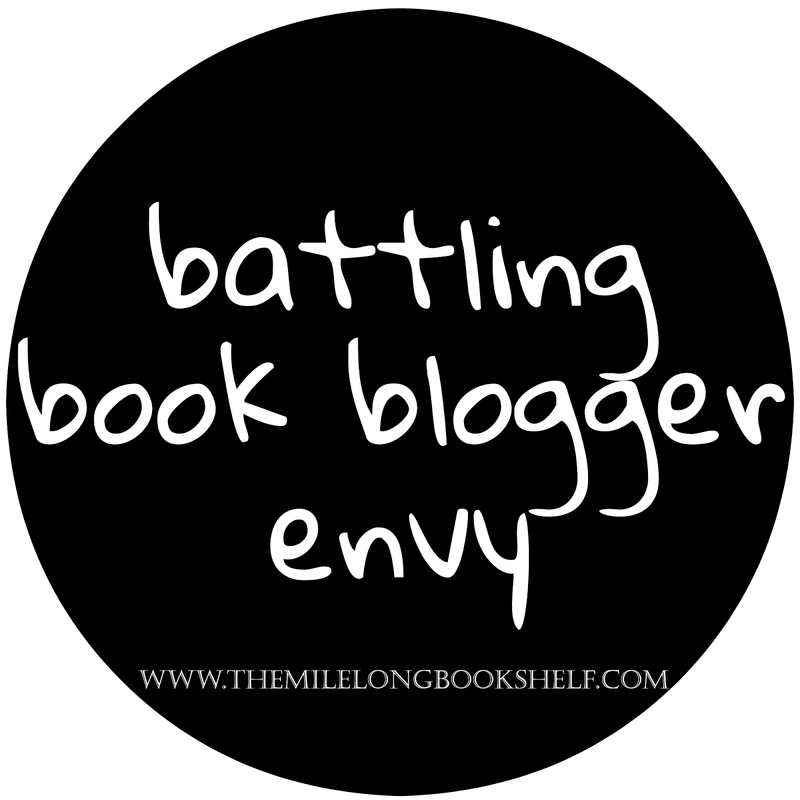 Chances are you started book blogging because you love books. Not free books, event invites or blog tours, but your pure love of literature. Go back to your roots. Read old posts no matter how embarrassed they might make you feel. See how far you've already come. Be nice to yourself. 4) Say something nice instead. There's the old saying, "If you can't say something nice, don't say anything at all." Well, I changed it to, "If you can't say something nice, say something nice anyway." It's not impossible (unless you're Peter from Divergent) and believe it or not it will make you feel better, I promise. It's not being fake. It's overcoming the negative feelings you're having under the surface. It'll probably make the other person a bit happier too, to share good news and get a happy response back. If it's an ARC you didn't get, it's not the end of the world - it's going to be published in a matter of months, you can get it then. And if you're really lucky, maybe someone will let you borrow it beforehand. While ARCs are awesome, at the end of the day they are just bound pieces of paper. Don't let them make you sad and doubtful of yourself and your skills! If it's an event you weren't invited to or couldn't attend, just remember that in a couple of weeks the hype will have died down. Like YALC - I didn't get to go and for the two days it was on and for a few days afterwards, I'll admit I was feeling pretty sad and I grumbled every time I saw a tweet about how awesome the event had been. But you just have to remember that it won't be long until photos stop being shared and event recaps fall into the archives. Then you can forget it. Most events will happen more than once (again, like YALC or Hay Festival) and if it's an author signing then it's likely they'll be back near you one day. Just try to feel happy that there are people out there who got to go - they're lucky people, and no doubt there's been something you've done that they're envious of. And if these don't work, maybe it's time to take a blogging break and come back to it with fresh eyes and a refreshed mind - it'll do the world of good and you'll come back with more energy and love for blogging, too! Blogging is ridiculously hard work and very time consuming so don't feel guilty about needing a few days or even a few months away from it. "Be a little kinder than you have to." What are your tips for keeping the jealousy at bay? This is a really great post Amber, that serves to be a great reminder for what blogging is about! Blogging envy is bound to happen to everyone, but it's how seriously you take it that is the key. I love this, brilliant post! I think these tips can be used for just about anything, not just blogging, but anytime you're feeling jealous! Great post! I try to remember that everyone starts somewhere! Oh my god, this is a really great post! I think it's brave and brilliant of you to tackle this issue. Sure, we all know it happens but it's rarely talked about. For that alone, this post is already amazing. But then you also gave amazing tips! I love all of them especially #3. Just last month I was feeling pretty envious of other bloggers who receive tons of comments on their posts. Which was pretty pointless, really, because they've been blogging longer! I even began to question if blogging is right for me. I thought about stopping. But then I receive some good comments and praises on the way I review and I remembered that I am blogging because I love books and someone else out there appreciates that. I've also found that the blogging community is a really fun, kind, and supportive group. And I'd like to think that those traits have rubbed off on me. I think I'm the odd duck here because I've never had issues with this. I don't participate in ARC programs though, so that helps I think :) I've seen multiple posts about this topic though, so I do think it's a real issue for many book bloggers. Great post today! I picked up 'We Were Liars' today so this post is pretty relevant! Haha! I absolutely loved reading it, Amber! I used to feel really upset - and wondered what was wrong with my blog - when I would see those sites with more followers and pageviews. I think it does make you question whether you're good enough. But, slowly, I'm coming out of that. Instead, I stick to the positives, and it helps me feel much better. Great post Amber, and can carry over to life in general.If some one is mean or snarky, I tell my kids to killl them with kindness it usually flabbergast them and takes the wind out of their sail. Also someone may be getting all the arcs you want, but wishes they could walk or run. (wheelchair bound) You never know the whole story behind the blogger.